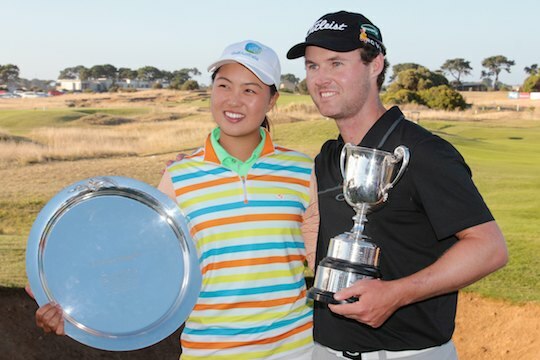 Teenage amateur Minjee Lee has emphatically announced herself as a player on the world stage by claiming her first victory in a professional golf tournament with a dominant performance in front of enthusiastic galleries at the Oates Women’s Victorian Open. The seventeen-year-old from Perth shot a closing six-under-par 68 to finish at 16-under-par 279 at the Thirteenth Beach Golf Club, erasing any lingering disappointment after fading over the closing stages when in contention at the Women’s Australian Open last week. “It feels unbelievable, it hasn’t really sunk in yet, I’m pretty happy and just stoked to have won.” said the champion, who plans a ‘gap year’ of selected amateur events around the world in 2014 before turning professional. Starting the day with a three-shot lead over the experienced Sarah-Jane Smith, Lee quickly stretched her lead after a nervous start as Smith struggled to keep pace. Lee’s lead became virtually unassailable after birdies at the 5th, 6th, 8th and 9th saw her make the turn with a five-shot lead. The galleries following the final group enjoyed the superb conditions and pondered the inevitable comparisons with New Zealand teen phenom Lydia Ko as Lee completed the tournament in style, closing with a final hole birdie to finish six ahead of Vikki Laing from Scotland. Laing herself had blitzed Thirteenth Beach with ten birdies in a final round 66, claiming second place at 10-under par a stroke ahead of Smith (73). Laing carded an incredible nineteen birdies over the final two rounds after starting the weekend in the middle of the pack at 5-over par. Her brilliant weekend earned her the first place cheque of $22,500, guaranteeing she finished her six weeks playing the ALPG season on a high. Lee’s exploits over the past month – starting with the successful defence of her Australian Amateur title, a second place finish at the Volvik Ladies Masters, T11 at the Australian Open and now this victory – will no doubt see invitations from tournament hosts on the LPGA and Ladies European Tour flood in, as they should. The ALPG’s Club Car Series, which awarded a $15,000 bonus pool to the top five players over seven events, was also concluded following the Victorian Open with Sarah Kemp winning her second Series crown. Kemp had a very consistent summer and earned $6,500 from the pool after closing out the Series by finishing T4th at Thirteenth Beach.